Credit: NASA/CXC/PSU/D.M.Alexander, F.E.Bauer, W.N.Brandt et al. 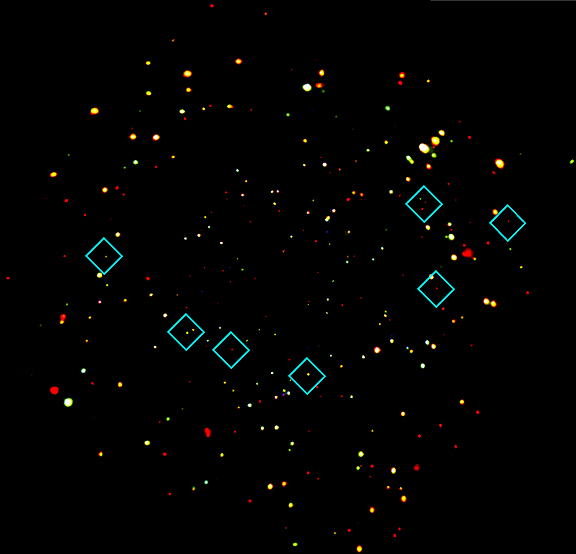 The Chandra Deep Field North image (left) was made by observing an area of the sky three-fifths the size of the full moon for 23 days. It is the most sensitive or "deepest" X-ray exposure ever made. The faintest sources produced only one X-ray photon every 4 days. 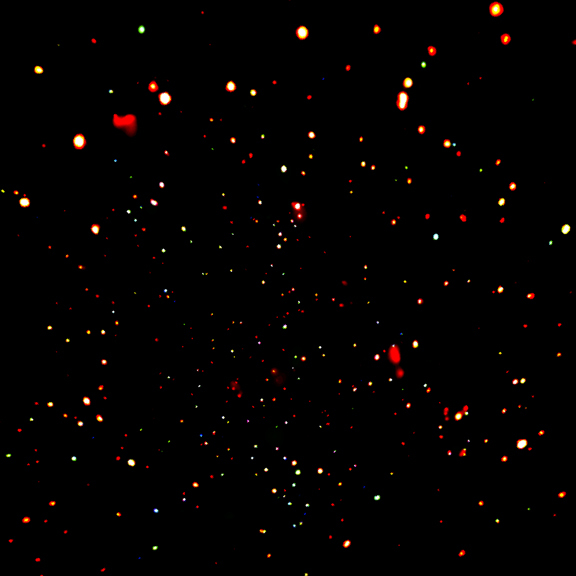 More than 500 X-ray sources are present in this high-energy core sample of the early universe. Most of the sources are supermassive black holes located in the centers of galaxies. If the number of supermassive black holes seen in this patch of the sky is typical, the total number detectable over the whole sky at this level of sensitivity would be 300 million. By combining the Chandra and Hubble data for this field, astronomers can take a census of the fraction of young galaxies that contain active supermassive black holes back to a time when the universe was only about one billion years old, less than 10% of its present age. The data show that these very distant supermassive black holes are rare, more so than expected. The data indicate that it takes about 700 million years for a supermassive black hole to accumulate the millions of solar masses of gas needed to produce a powerful X-ray source. The relatively slow growth of the supermassive black holes may be due to a reduced gas supply created when early generations of massive stars exploded as supernovas and blew gas out of the galaxies. However, it is possible that a few supermassive black holes could have formed earlier. Seven mysterious sources have been detected in the southern Deep Field by Chandra (right), but not by the Hubble Space Telescope. These sources, which are likely supermassive black holes, have also been detected in infrared. The optically invisible sources could be central black holes in unusually dusty galaxies where the optical radiation is absorbed by the dust. Or, the mysterious sources could be candidates for the most distant galaxies ever observed. In the latter case, the red shift due to the expansion of the universe has shifted the optical radiation to infrared wavelengths, and we are seeing them as they were when the universe was only about 500 million years old. The detection of most of the mystery sources at infrared wavelengths is consistent with either explanation. Further observations at X-ray, optical and infrared wavelengths will be needed to determine the exact nature of these objects. The Great Observatory Origins Deep Survey (GOODS) aims to unite extremely deep observations from NASA's Great Observatories, Hubble, Chandra, and Spitzer with data from XMM-Newton and some of the most powerful ground-based facilities. Credit NASA/CXC/PSU/D.M.Alexander, F.E.Bauer, W.N.Brandt et al. Scale Image is 28 arcmin on a side. Distance Estimate Distances of the objects vary over a wide range between a few thousand light years and more than 12 billion light years.